A Waterman CF fountain pen from the 1950s. Black barrel with gold plated cap and a fine 14k nib. It will ship with a Waterman CF converter. Excellent + condition. Product Name Waterman C/F Pen. The C/F stands for "cartridge filler." Manufacturer and Year Waterman, made in USA -- 1950s. Length Both are about 5-5/16"
Filling System Cartridge/converter. We have located one of the hard to find converters and will install it in the pen, but we don't know if you'll be able to find a replacement if this one ever gives out. The challenge with Waterman CFs: the cartridges and converters are no longer made and inconsistently available. To use these pens, most modern day owners resort to refilling the cartridges with a syringe. 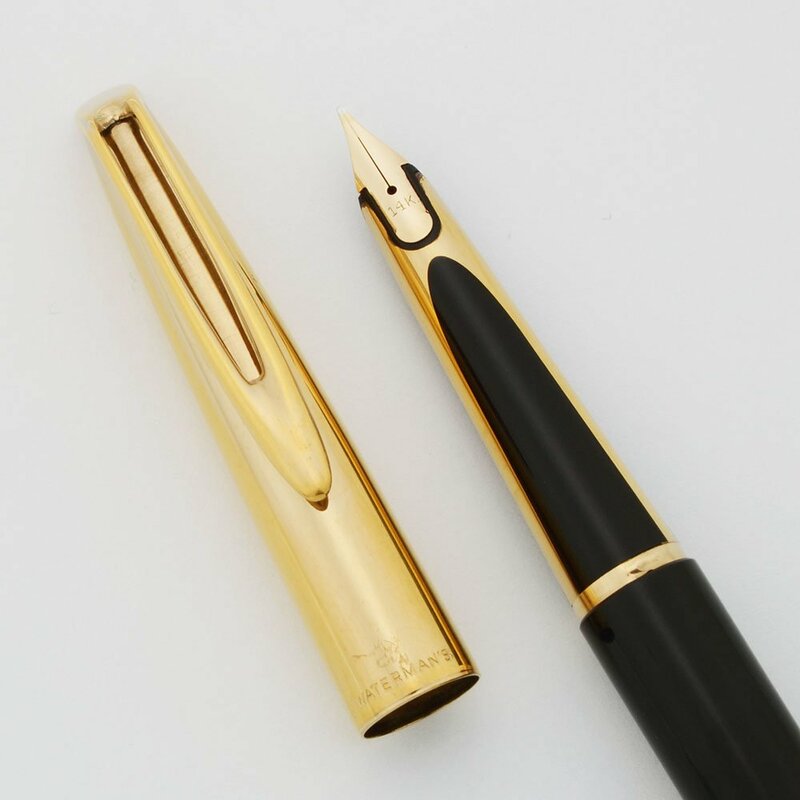 Color Black body with a gold plated smooth cap. Nib FINE 14k nib is smooth and slightly springy. Condition Superior condition. The pen has low handwear and no dents. There is a mark of plating wear to the right of the clip and a small worn area on the interior part of the wire-like clip. No personalization or major wear. Ships with a Waterman CF converter.